1995 - Michael and Lisa Marie welcome King Nana Amon Ndoufou IV, ruler of Sanwi, at Los Angeles airport on a 4 day visit. 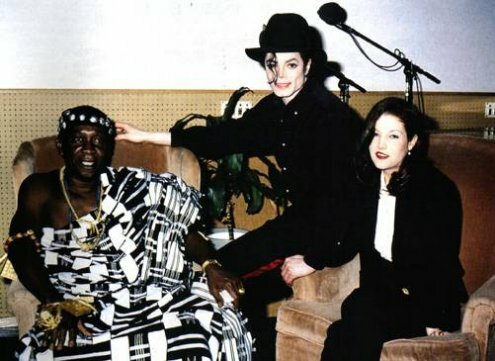 King of Pop Michael Jackson and his wife Lisa Marie Presley-Jackson played host to King Nana Amon Ndoufou IV, ruler of Sanwi on the Ivory Coast, during a break from his recording sessions in Los Angeles. Smiling broadly and exuding a special joy, Jackson greeted the exalted ruler who had crowned him King of Sanwi three years ago when the "King of Pop, Rock and Soul" visited the West African nation, one of six countries he toured on a goodwill trip to Africa. It was Black History Month in 1992 when Jackson was crowned King of Sanwi during impressive ceremonies held in the Village of Krindjabo, located near Abidjan, Ivory Coast. Called the "prodigal child of the Bible," the King of Pop was regal in bearing as the crown of gold was placed upon his head. During the King's visit to Los Angeles, Jackson took pride in hosting King Ndoufou IV, the most important Akan ruler in the Cote d'Ivoire (Ivory Coast). "Michael Jackson was extremely pleased and delighted to host the King." During the 17th and 18th centuries, four Agni clans crossed the Camoe River and established themselves at Krinjabo. The head of the first clan was immediately crowned King of Sanwi, because the Akan cannot conceive of human society without a King. King Ndoufou is more than a symbol, he is the spirit of his people and the father of his subjects. His person is sacred and inviolate. The King identifies with his deceased ancestors. That is why, according to tradition, he is called "Nana," which means old wise man. No matter what his actual age, the King is a sacred man and is called "Nana" by all of his subjects, even the elderly, because he is ageless and, therefore, the eldest. While in the U.S., King Ndoufou and his representatives brought greetings from President Henri Konan Bedie and the people of the Ivory Coast. Ndoufou and his representatives made tentative plans to meet with U.S. businessmen to inform them of investment opportunities in the Ivory Coast. They also scheduled a meeting with Atty. Johnnie Cochran, the chief defense attorney for O.J. Simpson. Cochran is honorary consulate for the Ivory Coast. 2003 - It is announced that Michael Jackson is to be the subject of a fly-on-the-wall documentary after Martin Bashir was granted permission to follow the singer for eight months. Granada say Bashir was given "unprecedented and exclusive access" to Jackson for the 90-minute profile, which will be shown on ITV1 on Feb. 03, 2003 as a Tonight with Trevor McDonald special. Tonight editor, James Goldston, said: "The film is an extraordinary insight into the life of one of the most famous and controversial figures in the world. "We have been filming with Michael Jackson throughout one of the most turbulent periods in his life. The results are utterly compelling - viewers will not believe what they are seeing." This entry was posted on 20 January 2011 at Thursday, January 20, 2011 and is filed under 1995, 2003 . You can follow any responses to this entry through the comments feed .